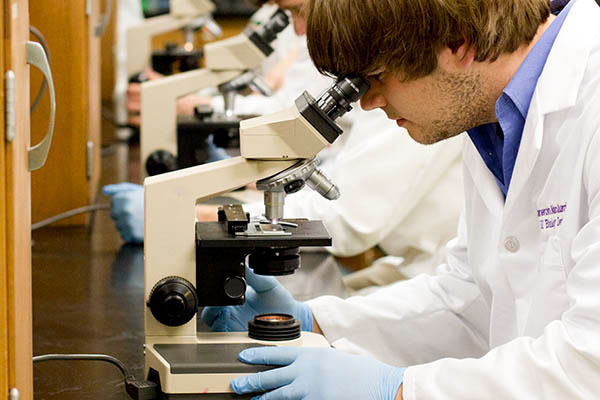 Prepare yourself for the career of your choice with our customizable biology degree. Our faculty are world-class scientists who stay current in their field as the world of science evolves. Let us ready you to be a middle or high school teacher. As a biology teaching major, you'll get to network during clinical practice classes, which will set you up for employment by graduation. You'll have the chance to go to the Tennessee Science Teachers Association meeting or the National Science Teachers Association meeting. You'll get to learn about teaching ideas, influential research and network with other science teachers from across the U.S. Whether you choose our teaching or general biology degree, our scientists will mentor you and ready you to think critically. You'll grow your working knowledge of biology. So come gain research experience in our state-of-the-art laboratories. Your time here will equip you to enter research graduate programs or professional schools, too. Our graduates are in careers as physicians, dentists, teachers, pharmacists, veterinarians, physical therapists, physician assistants, research scientists and more. Biology teaching majors receive the same core as biology (general) majors. A special course developed only for those pursuing teaching is Methods of Teaching Biology. This is a 3 hour course usually taken with Clinical Practice II, which combines content with pedagogy. In this course, students learn not only their craft but also have time structured for edTPA, safety in the classroom and grant writing. Optional. See the form on molecular biology for research internships in biomedical science. For those interested in “organism level biology” we have opportunities in the Tennessee State Park Service, Tennessee Aquarium in Chattanooga, Mote Marine Laboratory and Aquarium in Sarasota FL, Nashville Zoo at Grassmere, Cincinnati Zoo, Walden’s Puddle Wildlife Rehabilitation Center, Warner Parks, and Tennessee Department of Environment and Conservation to name a few. * A minimum grade of "C" in each of the core courses is required. ** Variable credit courses used to satisfy the major elective requirement must be at 2 credit hours or above and are subject to approval by the academic chair. Each biology major must take the Major Field Achievement Test in biology prior to graduation. **A minimum grade of "C'' in each of the biology courses. Biology teaching majors have a built-in minor in education. Note: Students may substitute Physics PH 2414 and Physics PH 2424 and its calculus prerequisites. Note: ***This program is designed specifically for students who wish to matriculate to the Lipscomb University College of Pharmacy. After the first year of pharmacy school, specific pharmaceutical sciences courses will be used to satisfy the remainder of the undergraduate biology requirements and students will then be awarded a degree in Biology. ** Variable credit courses used to satisfy the major elective requirement must be 2 credit hours or above and are subject to approval by the academic chair of Biology. **** Students may substitute Physics 2414 and 2424 in place of Physics 1241 and 1224. No stranger to the Lipscomb University campus, Garner Goode (’08 & ’11) joined the Office of Alumni Relations in September 2017 as director of alumni engagement. His role will focus on enhancing engagement between alumni and the university.